Bragg and Henry’s latest is a resounding statement on the foundation of one of the greatest achievements of American backbone. For those not in the know, that a British punk rock artist and an American-born alt-Americana-slash-jazz musician would be joining forces for a record celebrating some of the most traditional American folk songs would be an odd proposition to consider. Well, it still is, but it’s one with passion and meaning behind it. Billy Bragg and Joe Henry are on a mission with their latest record to release the idea that not only did the times surrounding the foundation of the Great American Railroad mark for a great leap forward in travel for the world, but it also had a fair amount to do with the shaping of popular music structure in both America and Britain to this day. Furthermore, their convergence of artistic styles in regards to arrangement and performing represent a means of paying respects to those who put their backs into it, working arduous, tireless days and nights through sickness, death, and poor payouts in part to have their hand in forming the infrastructure of an industrial revolution. Shine a Light: Field Recordings from the Great American Railroad was recorded by Bragg and Henry quite literally on-field throughout the aforementioned railroad, in waiting rooms and platforms beside the tracks at Union and Central tracks between Chicago and Los Angeles. After nearly 3,000 miles worth of travel, the inimitable duo took themselves out of Union Station and saw themselves finally recording their rendition of Gordon Lightfoot’s “Early Morning Rain” to cap things off. A respectful effort in and of itself, the album is elevated by the level of intrinsic personal collaboration at work throughout the 13 covers produced by Bragg and Henry as a duo. With a mutual respect for the history set into their project, they set forth with a glimmering admiration of the tracks that made their travels possible and for the artists who had originally written and recorded the material that they are performing in lieu of the Great American Railroad. For those who know Bragg and Henry, however, their ability to articulate a song in a professional manner is not exactly uncommon for either of the two, and never has throughout their collective 69 years active in music thus far. Forgoing the typically great musicality presented on the record courtesy of the two seasoned artists, the album mostly shines because of their choice of how to go about developing it. 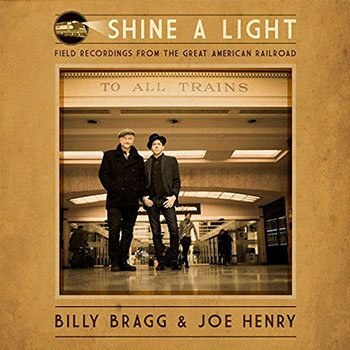 With the opportunity to leave the studio and embark on a train ride as Bragg and Henry had done in order to develop Shine a Light, the duo have done the history of the Great American Railroad that much more of a favor. By travelling thousands of miles on the tracks that tireless men had built for little to no recognition, it can likely be accurately assessed that it offered itself not only as a fun time for the two during their musical journey, but an enlightening one, as well. From “Rock Island Line”, to their incredible takes on “The Midnight Special” and “Hobo’s Lullaby”, and beyond, Bragg and Henry’s latest is a resounding statement on the foundation of one of the greatest achievements of American backbone and its influence on the world.